So this is what happens when you decide to go Frankenstein on your favorite flavors. Someone put it in my head that I was on a fusion kick about a month ago, and now my brain refuses to go anywhere else. Luckily, my tastebuds appreciate this track of recipe experimentation, especially when there’s Thai Chicken Fajitas on the menu. This dish was born out of a very out-of-character decision to clean out my refrigerator before everything went bad… or, equally likely, overflowed on a warpath of neglected food fury and buried me alive. I had everything so stacked up that my fridge looked like the very tense last seconds of a Jenga game. We’re talking over 15 limes tucked into corners, enough tortillas to feed all of Mexico City, at least 20 jars of barely-used condiments, and so much Thai basil that you’d think I had just taken out some sort of herb cartel. Say my name. Eisenberg. That joke probably didn’t stick the landing for those of you who don’t know my last name. Or never watched Breaking Bad. Or just don’t think I’m funny. 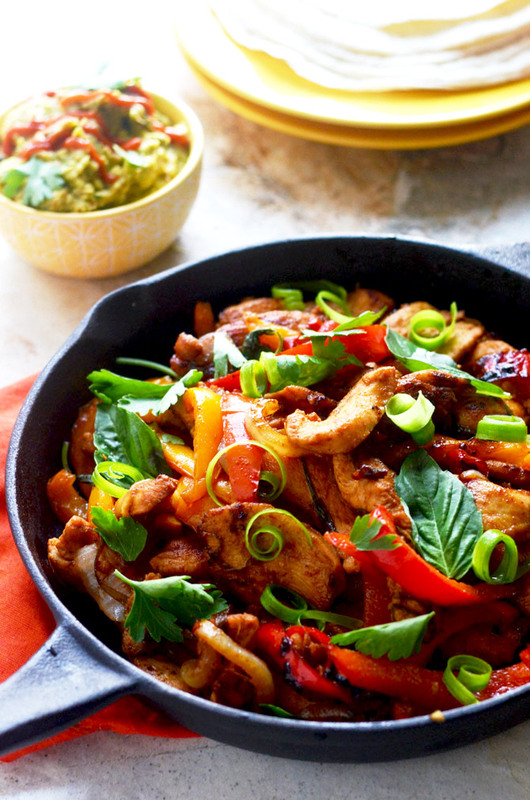 But back to those fajitas. A quick marinade and a cast iron skillet did most of the work, so much that I thought to myself “this is almost too easy”. Even when I’d typically be doing dishes, I found myself with none to wash (hallelujah), and I paced around looking for something that needed to be done. Uh… I guess I could check what’s on Netflix? I decided to curl my green onions instead because it made me feel like I was being productive. In reality, I was just throwing them in some ice water and, again, letting the water do the work– but hey, they look nice. If you’ve never curled your green onions before, here’s how it works: you slice down the length of the green onion to divide it into two strips. Then you halve each again. Then you have thin strips that are ready for dunking into a bowl of very cold water, and they curl up like little ribbons. 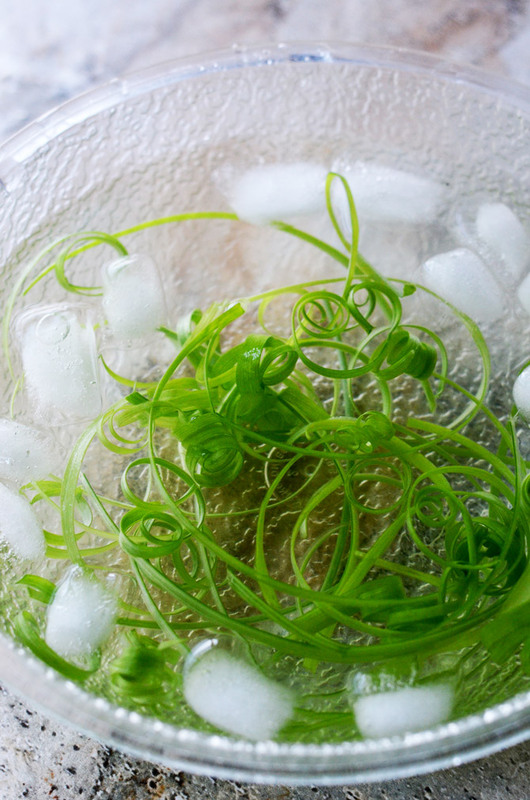 It’s one of the easiest garnishes you can make! 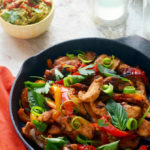 When the fajita ingredients–chicken, onions, bell peppers, and Thai basil– were all sauteed up, I topped them with the green onion, a few extra leaves of the basil, and some cilantro, but not before “taste testing” because it smelled too good to resist. And then it tasted too good to resist. And then 50% of the skillet was gone before I even got to serve it… woops. I was unsure how the marinade would turn out, but the combination of soy sauce, red curry paste, garlic, fish sauce, brown sugar, and lime juice flavors can most accurately be described as: OH WOW, THIS IS FANTASTIC, YES, OH MY, I NEED MORE, NOW, GIVE ME ALL OF THIS, EVERY DAY, FOREVER AND EVER. 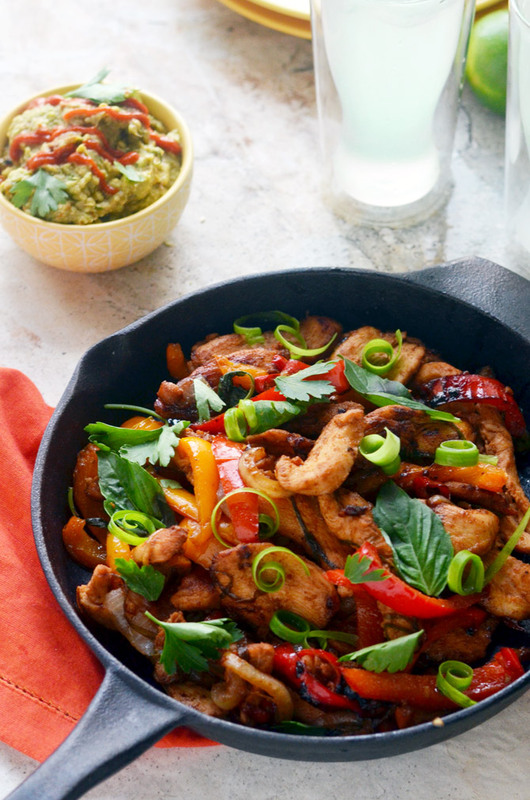 Seriously, you need Thai Chicken Fajitas in your life. 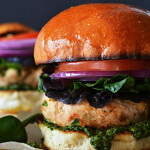 Serve it with Thai Basil Limeade and Thai Guacamole and try to remember to take a picture before you devour it all. 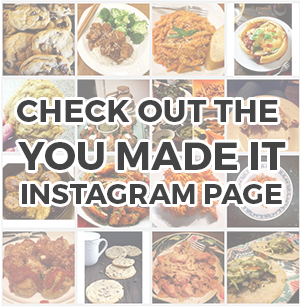 Tag #hostthetoast on Instagram or Twitter so you can show off your Thai spin on TexMex! In a large, sealable plastic bag, combine the soy sauce, garlic, brown sugar, curry paste, oil, fish sauce, and lime juice. Mix well. Lightly salt the chicken breasts and then place them in the bag with the marinade. Press out as much excess air as possible, seal, and refrigerate. 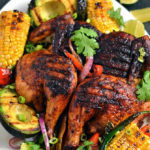 Marinate for at least 2 hours, or overnight. While the chicken marinates, slice your green onions vertically in half, and then halve them again, and again until they are very thin. Then drop them in a bowl of ice water. stir them around a bit to separate them, and then place the bowl in the refrigerator. 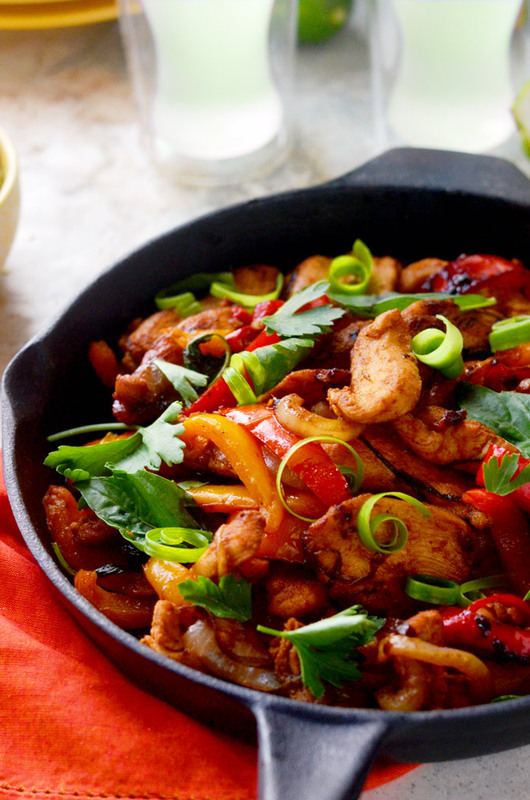 Heat a tablespoon of oil in a large skillet and saute the bell peppers and onion until tender. Remove the vegetables to a bowl and set aside. Transfer the chicken from the marinade to the hot pan and cook over medium-high until no longer pink, turning occasionally, about 6 minutes. Add the peppers and onions back to the pan, and add in the handful of Thai basil. Toss and warm through. 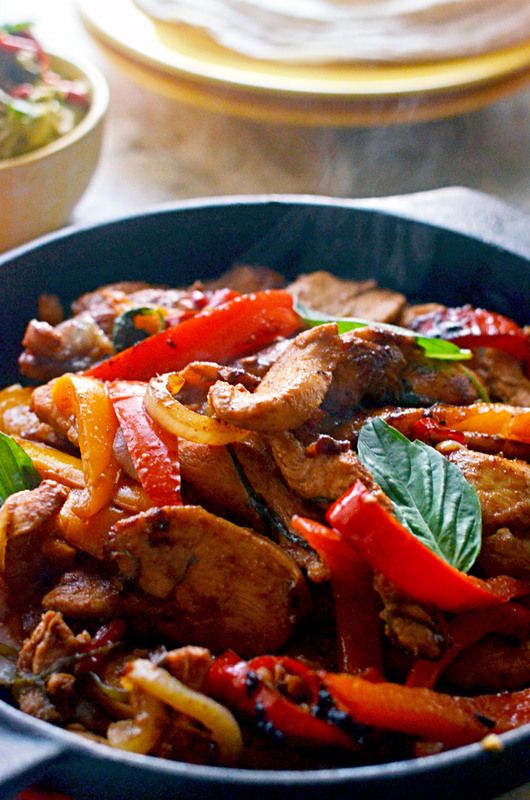 Remove from heat and top with the curled green onion ribbons, additional Thai basil, and cilantro. 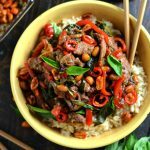 I made this for dinner tonight and it was absolutely wonderful! I had to do a little bit of subbing around (and added some chili flakes for an additional kick), but it tastes absolutely amazing! 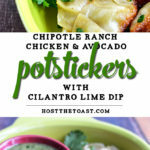 I’m adding this to my dinner repertoire!